Monforts Monfortex compressive shrinkage ranges for denim finishing are now even more cost-efficient and eco-friendly. Stretching and skewing functions for the denim fabric can be performed by a modified Thermex Thermo stretch unit. This configuration allows fabric speeds of up to 40 m/min to be achieved with 14.5 oz/yd² denim on the single rubber version. 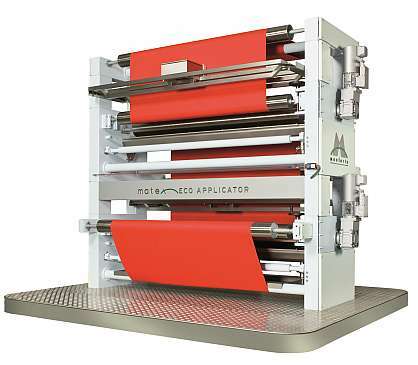 A ‘double rubber’ version comprises two compressive shrinkage units and two felt calenders in line. Together with the innovative Thermex Thermo Stretch, fabric speeds of up to 80 m/min can be achieved with 14.5 oz/yd² denim. On both range versions, the denim fabric is stretched and skewed far more gently than with conventional range combinations. With the larger diameter of the shrinkage cylinder in combination with the automatic rubber belt grinder, the standard is determined in shrinkage technology for minimum residual shrinkage values and optimum fabric hand. The proven, energy saving, Eco-Applicator soft coating process from Monforts for the application of liquors and functional chemicals is now available for denim fabric applications. The Eco-Applicator offers significant energy savings with reduced liquor application. The multi-functional and multi-purpose process ensures the lowest energy input for consecutive drying to its minimal liquor application. Visitors of the ITMA 2015 will get more information at the Monfort´s Booth No. E101 in Hall 10.